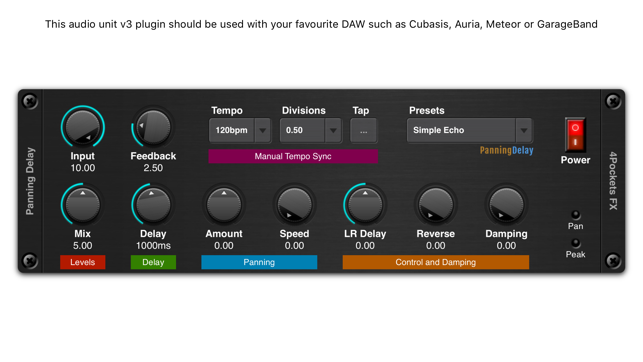 This is a AUv3 compatible digital delay which can be used as plugin with your favourite DAW such as Cubasis, Meteor, Auria or GarageBand. It supports a modern graphical interface and presets with stereo meters for monitoring signal levels. 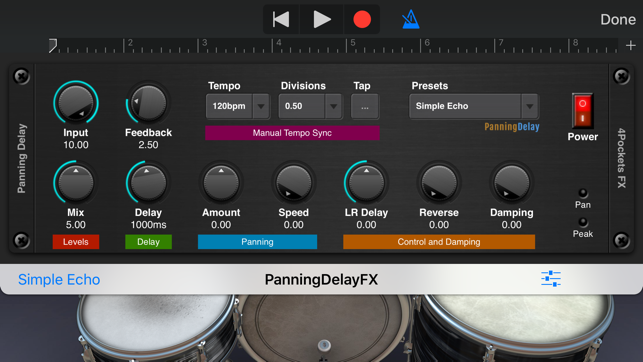 This stereo digital panning delay allows you to specify a compositions tempo and beat divisions in order to create some pretty crazy synced delay patterns. You can further specify how the stereo separation for the left and right channels, even apply panning and reverse audio effects to the mix. Added a 'BPM Sync' toggle to allow you to specify all tempos. Nice delay with some extras like reverse and panning. Nicely done!